Owen McGoldrick has been a commercial photographer for over 25 years. He received his BA in photography from the Philadelphia College of Art, and is the recipient of a Ford Foundation Grant from Columbus College of Art and Design. Owen works with architects, interior designers, manufacturers, hotels, corporations and small businesses towards the goal of delivering unique and memorable images that stand the test of time. Owen helps his clients achieve their maximum marketing impact by providing world class photographic imagery. 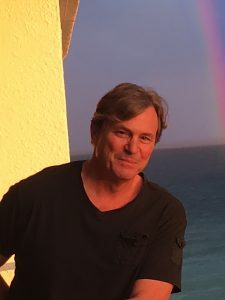 In addition to photography, he is the author of several books, including American Haiku, a collection of poems, part memoir and part satire, published in 2012. His poem “american haiku #27”, won first prize in the 2013 Byron Bay Writer’s Festival, one of Australia’s premier literary events. A lover of the American West, photographs from Owen’s personal portfolio of work entitled American Gothic 1989-2004, can be found beautifying interior spaces across the US in homes, businesses, universities and in personal collections.